There’s no better time to mix up sparkling cocktails than the holidays! Between Christmas parties and New Year’s Eve, it seems like December is a month-long celebration. Even more of a reason why it’s referred to as the most wonderful time of the year! With baby girl due right before Christmas, I’m so excited to be able to swap out my mocktail for the real deal and partake in the celebrations! wait to add the champagne until you’re ready to serve so the drinks stay nice and bubbly. Since I wasn’t able to taste test the finished product, I had a friend who loves bubbly drinks just as much as I do give both of these recipes a stamp of approval! Add vodka and Cosmo Mixer to champagne flutes and top with champagne until 3/4 of the way full. 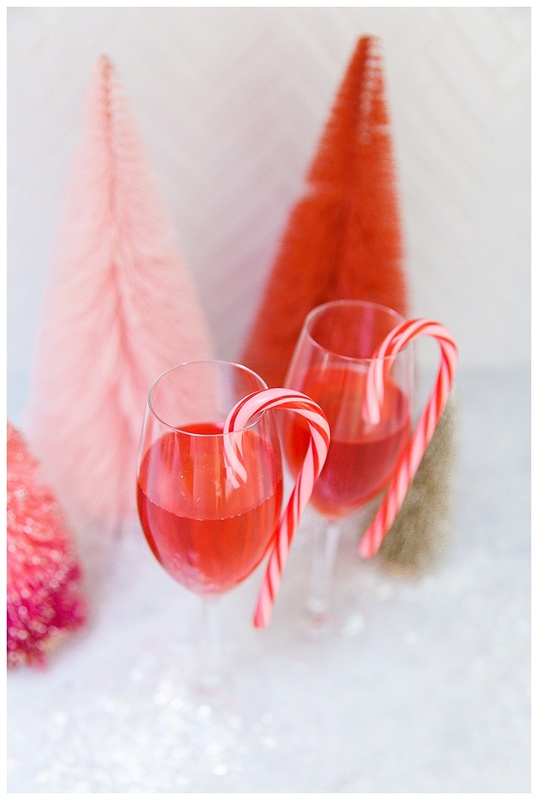 Add the candy cane to the rim and make sure it isn’t submerged in the cocktail until you’re serving. This is my take of a poinsettia - basically a mimosa but with cranberry juice instead of orange juice. The Master of Mixes Cosmo Mixer adds a combination of cranberry with a twist of lime. The colorful candy cane garnish takes it to the next level. I always recommend using brut or extra dry champagne or sparkling wine for mixes cocktails to help control the sweetness. Add gin, elderflower liqueur and Master of Mixes Collins Mixer to a cocktail shaker filled with ice. Shake vigorously. Pour into champagne glass. Top with sparkling wine. Garnish with a dried lemon slice. and is a huge time saver - no need to squeeze a bunch of lemons! I love how the elderflower liqueur adds notes of floral sweetness. I used dried lemon slices as a garnish but fresh slices would work too! Thank you to Master of Mixes for partnering with me on this post. All thoughts and opinions are my own.